Alma was born on 18 September 1871 at Snow’s Mill, near Dix, Illinois. 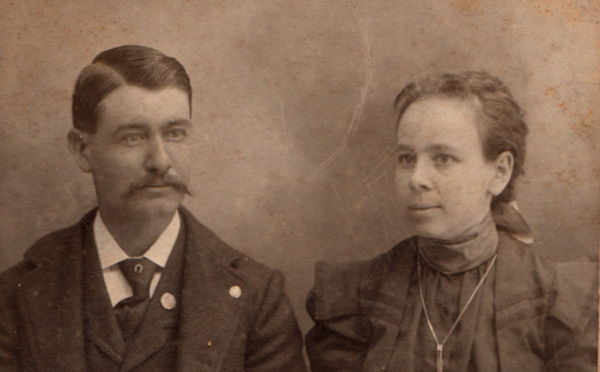 On 23 March 1891, at the age of 19, she married William Rollie Crowder (known simply as “Rollie”), the son of William and Leticia Crowder. Rollie was a fireman for the Louisville and Nashville Railroad. They lived in Mt. Vernon some but for the most part lived in Howell, a neighborhood district of Evansville, Indiana. Rollie later worked as an engineer with the L&N railroad for more than 40 years, retiring in 1933. In his time off he enjoyed gardening and fishing. Rollie was an active participant in affairs of the Methodist Church and was known as a kind and generous man. Alma was also heavily active in the church. She served as President of the Ladies Aid of the Howell Methodist Church and was Treasurer for roughly 12-14 years. She was also First Vice President of the Foreign Missionary Society for two years; a member of the Official Board, and President of the Board of Stewards for 22 years. An art glass window with memorial plaque to Mr. and Mrs. W.R. Crowder has been placed in the Howell Methodist Church, which was also the beloved home church to a number of other Claybourns. Alma was a member of the Eastern Star and White Shrine chapters in Evansville and for 16 years she served as President of the Ladies Auxiliary of the Brotherhood of Locomotive Engineers and attened many of their national conventions. According to Ms. Threkeld, “She was good, kind, lovable and an excellent cook and homemaker.” Alma died on 13 October 1946 in Evansville and Rollie followed in death on 16 May 1947. Both are buried at Oakwood Cemetery in Mt. Vernon, Illinois. Bernard Crowder was born on 19 February 1893 in Mt. Vernon, Illinois. According to his World War I draft card he suffered from epileptic fits and lived in epileptic institution in Henry County, Indiana as of the 1930 and 1940 census. He died unmarried in March of 1943. He is buried in Oakwood Cemetery, Mt. Vernon. Birtie May Crowder (the spelling was later changed to Bertmae) was born 26 October 1896 in Mt. Vernon, Illinois and was educated in Evansville, Ind. She married (1st) on 24 October 1916 to Paul Gregory Pilkington (1893-1962) and together the couple lived in Indianapolis, Indiana. The two divorced and Birtie married (2nd) on 18 April 1928 to Loral Estis Christmas (born on 9 September 1895 in Warrick County, Indiana). [Loral Christmas was previously married to Delia M. Greer (1905-1925) on 22 December 1923 in Vanderburgh County, Indiana, but she died in childbirth along with their baby.] Birtie never had children by either husband. Bertmae’s outstanding characteristic was her happy and sunny disposition. She was always good company and fun to be around. She could play the piano by ear and could entertain in that manner. She was also an excellent cook. During the latter part of her life, Bertmae and her husband had an apartment and lived in the same house with her parents at the 3000 block on Arlington Ave. in Evansville, Ind. She died on 6 April 1944 following a serious operation and is buried in Elberfeld, Ind. with her husband’s people. Loral continued to live on Arlington Ave. and did not marry again. He died on 20 March 1982 in Evansville, Indiana and is buried with Bertmae. Donald Claybourn Crowder was born on 24 August 1898 in Evansville, Indiana. He married on 11 February 1928 to Charlotte Brown of Kansas City, Missouri (born 25 July 1903 in Missouri). His friends called him “Don” but the family always called him “Claybourn.” He graduated from Indiana University and sold men’s clothing to stores, working and traveling for Hart Schaffner and Marx; beginning in 1942 he sold McGregor sportswear, spending half of his time in Indianapolis and the rest in the larger Indiana cities. He was offered a job as Midwest Sales Manager for the same company but turned it down because it would have meant leaving Indianapolis where he was well and pleasantly established. He lived at 8355 N. Pennsylvania Ave., Indianapolis, Indiana. Donald died on 30 May 1960 and is buried in Crown Hill Cemetery. Charlotte died in April of 1974 in Crawfordsville, Indiana and is buried with her husband. Donald and Charlotte had one child, Janet, listed below. Janet Crowder was born 18 August 1932 in Indianapolis, Indiana. She graduated from DePauw University in Greencastle, Ind., in June of 1954. She married on 17 June 1954 to Jack H. King (born 8 July 1931) of Indianapolis. Jack was in the U.S. Navy three years, spending a year and half in Guam. He had one year of college before entering the Navy. Thereafter he worked with his father in an accounting firm where he worked half days while completing college work at Butler University. The couple lived at 401 West 44th Street in Indianapolis. Janet and Jack had three children, listed below. Cathy Ellen King was born on 4 October 1956. Karen Sue King was born on 12 February 1960. Debbie Lynn King was born on 2 March 1961.